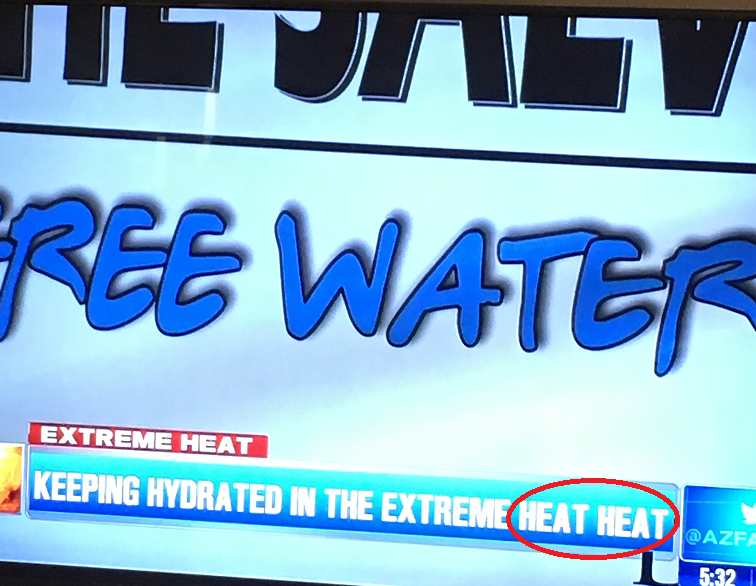 This was on my local news station this weekend since our big news is the record breaking heat wave we have in store this week. I know it will be hot, but I think one “heat” would have conveyed the message just fine. My cousin sent this one to me. 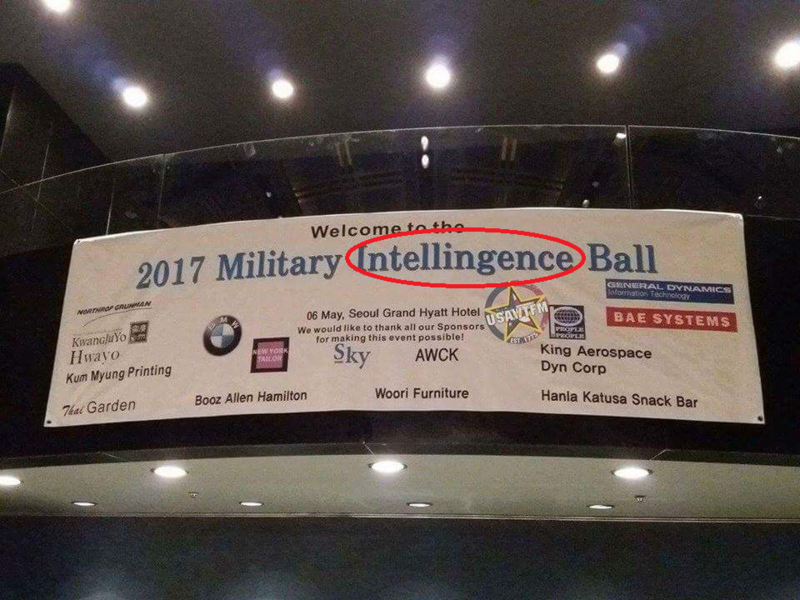 Seems to me that if “intelligence” is part of the name of your event, you would figure out how to spell it correctly. This is particularly important if you are spending the money for such a big banner. Some people think because they’ve written something and read along as they write, that’s good enough. Some people think they don’t have the time to proofread something that the author should have checked. Some people think they aren’t smart enough to proofread someone else’s work. And believe it or not, some people don’t think proofreading is important. Here is my take on that. The author’s reputation is at stake. While an author could be a great writer, could have great content, and could tell a great story, if it is hard for people to read, they won’t. 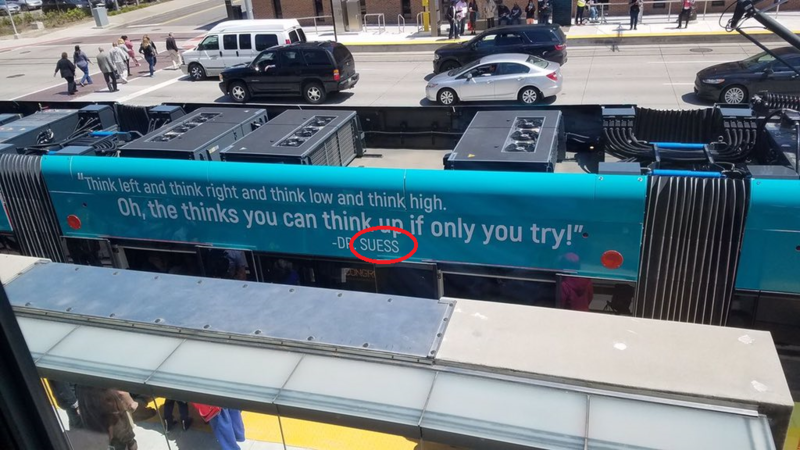 Not everyone is as interested in good grammar (or is a psycho–take your pick) as I am, but I do know people who can’t get through to the message the writer is trying to convey because of grammar errors. Once we see a few mistakes, we are obsessed with finding them all–all to the detriment of actually reading the substance of the message and, thus, the author’s reputation, in our minds, is not good. Particularly in the legal field and in legal documents, accuracy is important. Many a time errors have made a difference in how a legal document was enforced, how property in an estate was distributed, and how a lawyer’s reputation with the court was tarnished. Opposing counsel love nothing more than to bring substantial errors in filed documents to the court’s attention. Particularly when quotations are incorrect. If opposing counsel files a document showing that your attorney filed something as a quotation which was not an exact quotation, your attorney not only has the embarrassment of having opposing counsel bring that up, but it becomes part of the public record (unless the file is sealed), and regardless of how open the judge would like to be, it has to change their perception of your attorney, your firm, and your client. Although the misstatement of the quotation could have totally been a error in retyping the quoted language, because no one checked it and fixed it, it could have a huge impact on your case. Your writing delivers its message. Where there are errors in your writing, people sometimes have a hard time understanding your message. If people don’t understand your message, why are you writing? People good at proofreading like to help. 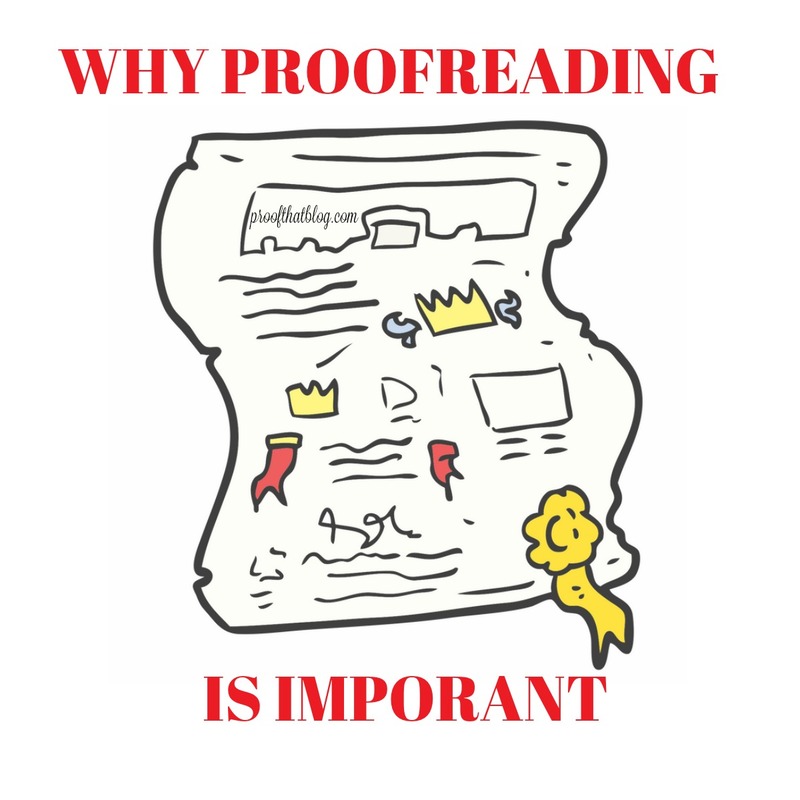 Most of the people I know who are good at proofreading would love to help you. Not only does it give us the “first look” at your writing, but for most proofreaders, our mission is to help others and, perhaps, to teach others. If you know someone who is good at proofreading and you need some done, go ahead and ask. The worst thing that can happen is that they say “no” and then you’re at the same place you started. Just two caveats: don’t take advantage and don’t take them for granted. You can’t call hysterical and ask them to proofread something right now and you need it back immediately. They MAY help you that one time, but probably never again. Exercise grace. If you pay attention to edits others make to your work, or you pay attention to proofreading lessons you could learn online (especially at a great website and blog like proofthatblog.com! ), or you make an effort to be better, you learn something you didn’t know yesterday. That’s all anyone can ask for–to learn something new every day. Your work product reflects YOU. If you are the author, your writing reflects you. People who don’t know you get their impression of you from your writing. They could believe that you don’t care enough about your work to make sure it is accurate. If you are supposed to be finalizing documents for someone else in your office and don’t take the time to proofread it and to make sure it is accurate and looks good, then the person who receives it is getting a bad impression of your entire firm and everyone in it–even though only one person wrote the letter or document–some people associate your firm with dumb mistakes. This association could be worse if the mistake was not just dumb, but was more of a major error in a document filed with the court. It seems that with the amount of time spent authoring and editing something, you would want to be proud of your work. Otherwise, why would you waste your valuable time doing it? All in all, you’ve spent the time and energy to write something you obviously want someone else to read, whether it is a blog post or an important legal document. You should be proud of your work so make it pretty, make it accurate, and make it grammatically correct. A friend sent this to me. 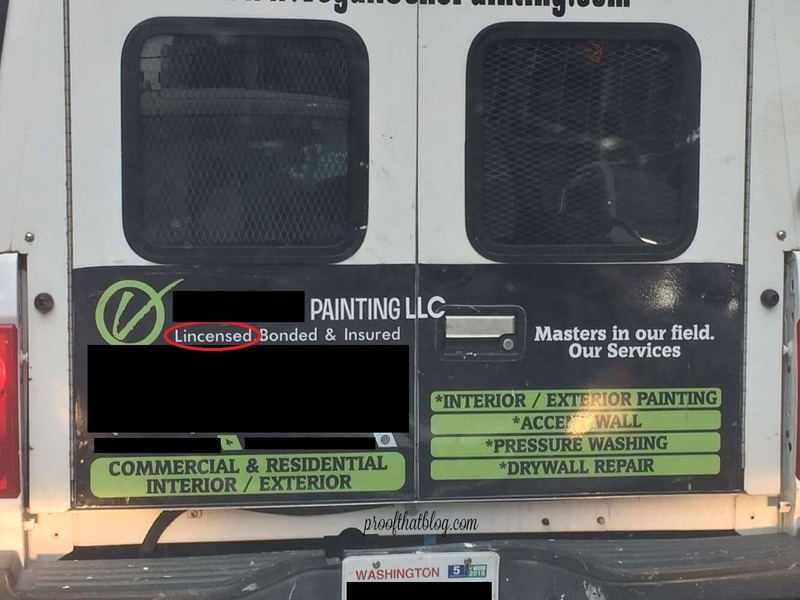 Apparently, this company is not a master of spelling! It is pretty important that businesses at least spell things correctly. I found this error on Twitter. If you are unsure exactly how to spell something, look it up.